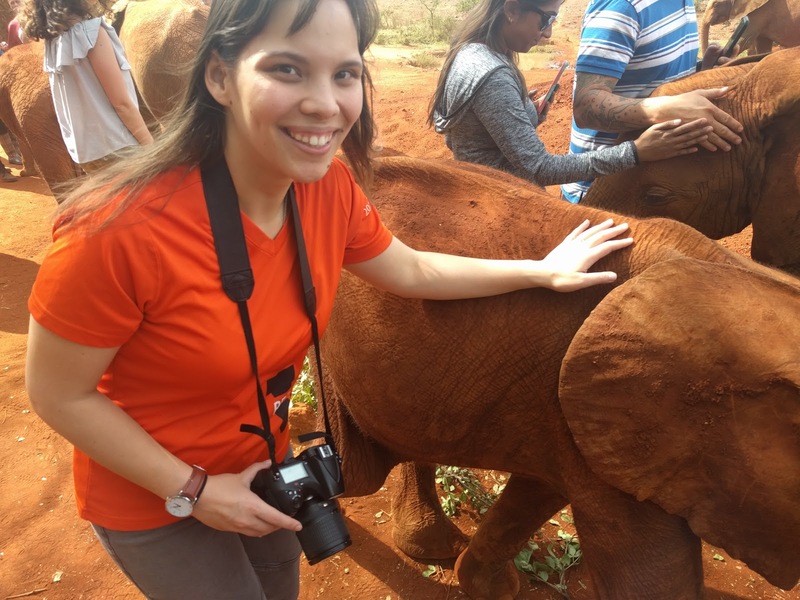 Seeing baby elephants was definitely on my Kenya bucket list, and we were lucky enough to see them on a private tour of the David Sheldrick Wildlife Trust. 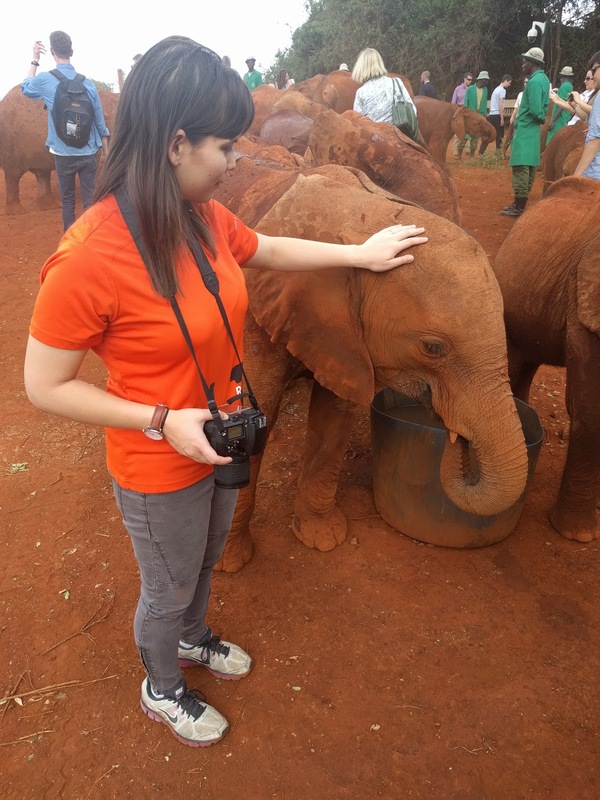 First, a little bit about David Sheldrick's: the elephants we saw were part of the Orphans' Project. 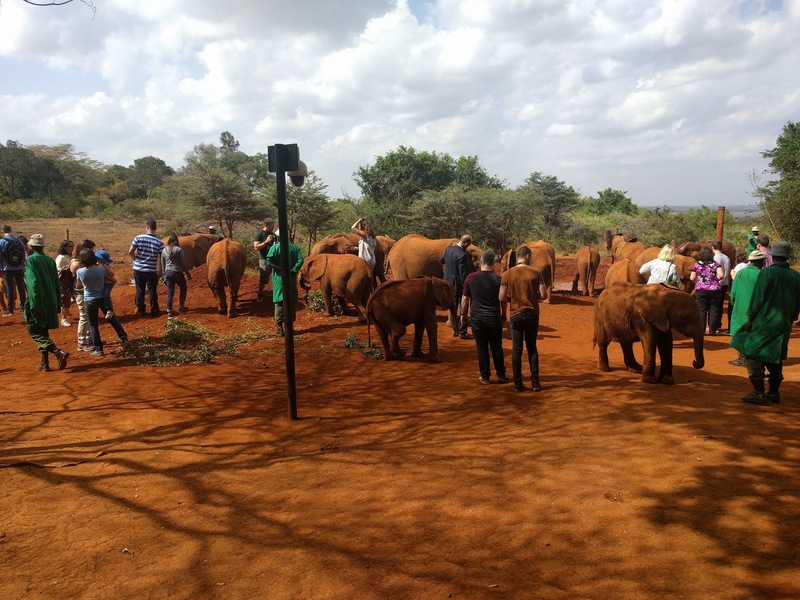 They rescue orphaned elephants that would otherwise die and reintegrate them into the wild after they pass the age of dependence on milk (about three years old). 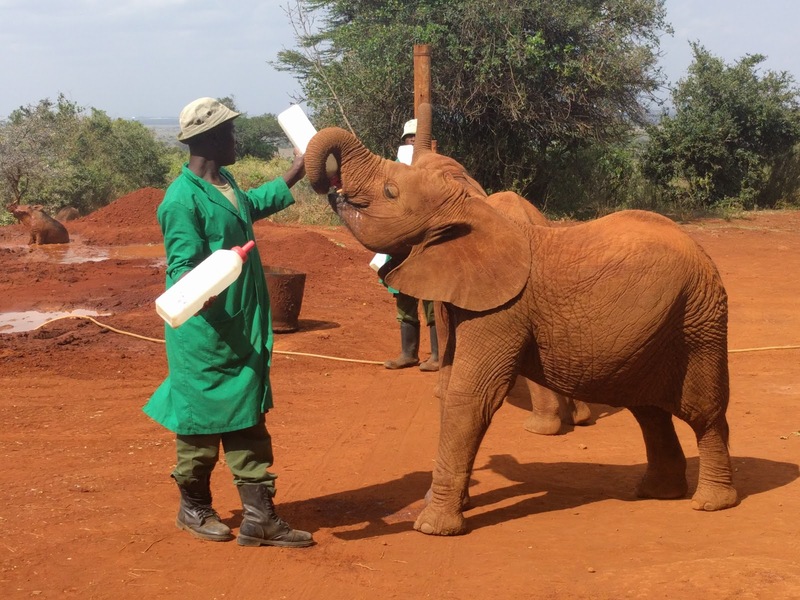 Reasons these elephants are orphaned include poaching, human-wildlife conflict, and drought. Some simply got stuck in the mud or fell into a well. 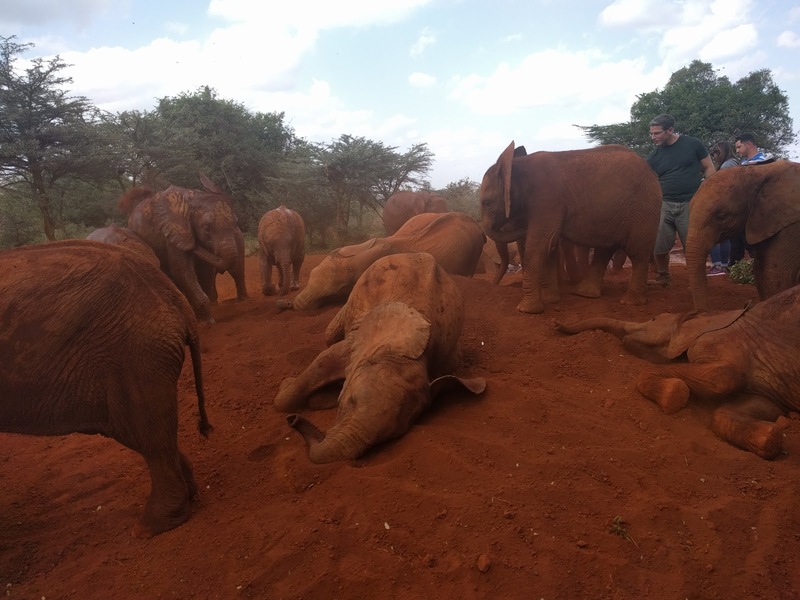 All of them owe their lives to David Sheldrick's, which has now successfully reintegrated over 200 rescued elephants into the wild! So how was the visit? "Delightful" is the best word I can think of to describe it. 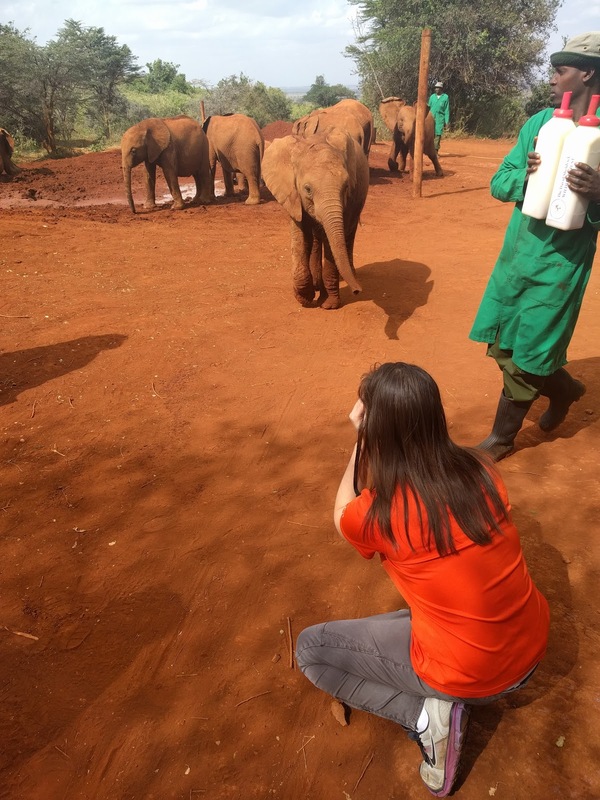 The elephants were so happy and playful; they lifted everyone's spirits. You could really see the love the caretakers and the elephants have for each other, too! I was surprised at how coarse the hair on the elephants was and how messy they were (flinging mud everywhere). They also chugged milk like champs. I even took photos for work on a real camera! (I love being a PD Officer.) Those photos are for the Embassy's social media pages, though. M used my phone camera to take pictures for the blog. We finally visited the famous Maasai Market! There was a huge range of handmade crafts, artwork, traditional clothes, and tourist knick-knacks. It was crowded and chaotic, but fun. Well, I had fun. It wasn't really M's scene, but he survived. We bought just a few things. I snagged the stunning work of art below, done by a man who calls himself the local Picasso. It depicts a farming village community and the classic African sunset. I can't wait to get a frame for it! I also found this sweet, handmade nativity scene. 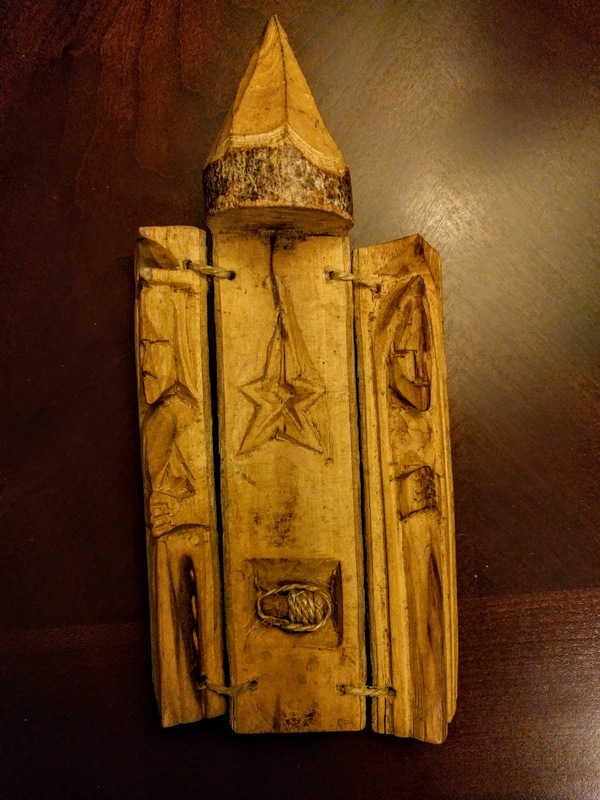 The sides fold together over the baby Jesus to make a pencil-like shape when closed. I found the simplicity of the materials (wood and twine) to be a perfect example of the humility that rightfully fits the true spirit of Christmas. 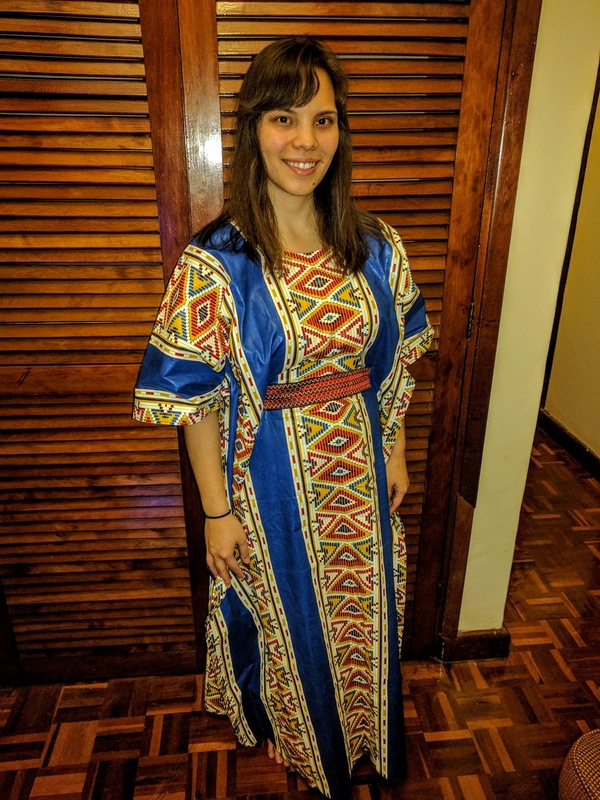 Lastly, I picked up a cool "African" wax print dress. (I say "African" because it was probably made in China and is only debatably African either way). It's an interesting design because it ties around the waist on the inside of the dress to make the unique shape. Go in with a plan. Decide what you want to buy before you get there, or you'll quickly be overwhelmed by the number of stalls and types of wares. Do you want clothes, shoes, or jewelry? A gift for someone's house? You can still deviate from the plan if you find something you like, but having some idea of what you need as a guide helps a lot. Say no. People may offer to help you shop, try to draw you to their side of the market, or even just start putting jewelry on you. It's okay to say no. Haggle. You're expected to bargain down from the offered price. I've heard a good rule of thumb is to halve the initial suggested price, but I was able to go even lower (about 30-40% of the offered price) on my purchases. Know that you'll probably pay premium anyway just by virtue of being a tourist. As always in Kenya, Kiswahili helps. Watch your wallet. Children pressed boxes of gum they were trying to sell against our car as we tried to drive away. Vendors gave us extra attention (and were extra pushy) because we looked foreign. People did us "favors" we didn't ask for and then demanded payment. We were completely fine, but largely because we were careful. Double-check logistics. The location of the Maasai Market changes daily, so make sure you know where you're going, how you're getting there, and (if relevant) where you'll park. We're here, and we're finally feeling settled! The picture above is from our house. Our stuff obviously hasn't all arrived yet, so it feels very large and empty. 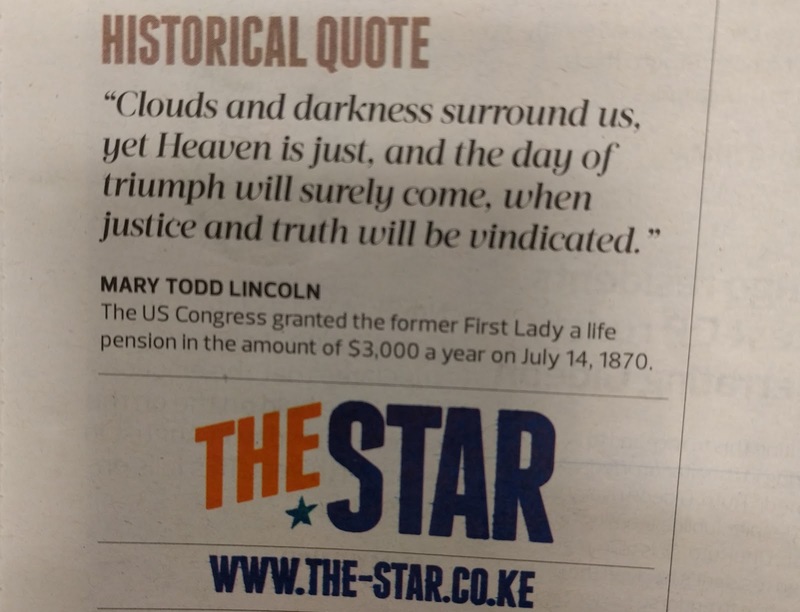 Kenyans speak much more softly. I am repeatedly reminded of how loud Americans are in comparison when I'm sitting in mixed meetings or struggling to understand someone speaking (what to me seems) extremely quietly. The weather is utter perfection. We love never needing AC or heat. It's really hard for a diplomat with security restrictions to live here without a car, but driving here is nuts. If driving on the left side of the road weren't intimidating enough, pedestrians just randomly run out into the street if they can so much as sense a hint of hesitation. Also, to the Western eye, matatus and boda bodas are pure death machines. Security is noticeably higher here than what we're used to pretty much everywhere, from homes to malls and other public spaces. Malls aren't just places to shop here. They're important social spaces and event venues. Kenyans are very warm and friendly, as a general rule. Kiswahili/swahili is very, very useful here. We usually only hear English when at least one foreigner is involved. Tribes are extremely numerous and complex. I have no hope of learning all the local ethnic nuances in two years. There's a lot of public concern about the upcoming elections. We've heard about them in passing everywhere from restaurants to church. Kenyan music is delightful. I'll try and devote a post to it at some point. The cost of living is great by our standards. We've heard others say it's expensive compared to other parts of Africa, but we find Nairobi very budget-friendly. The Kenyan food I've tried so far is delicious but not exactly the healthiest thing I've eaten. The cuisine and entertainment options here are very international. I can get Korean food right by where I work and then go see a Kenyan or Hollywood film at the mall. Even the capital has a lush environment. We're in the city but live right next to a beautiful forest. Life is a lot easier (or at least cheaper) with a residence card. I want to include photos of the beautiful local landscape in future posts. I can't take pictures while driving around, so I'll have to wait for a good opportunity. Note: this is a long overdue post from when I was back in Washington, as I waited to have the official photo and a good Internet connection to post it. 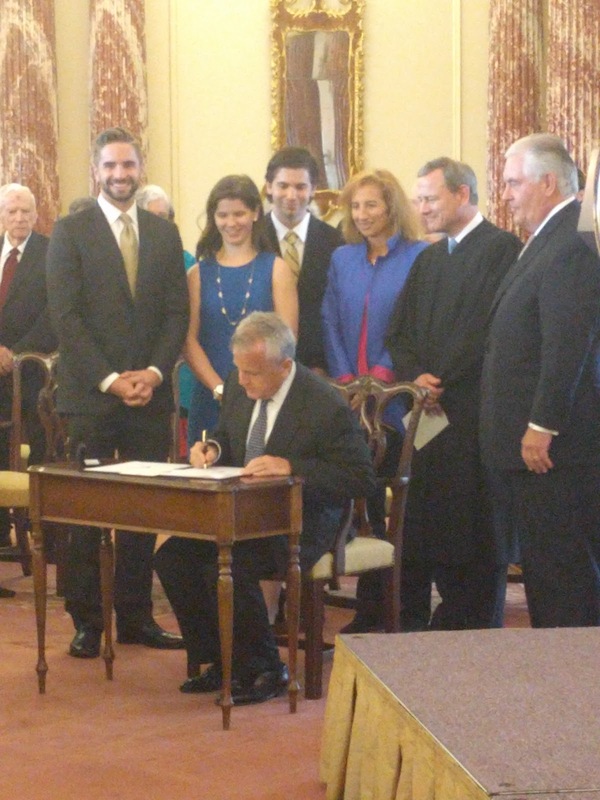 I was very lucky to have the honor of attending the Swearing In Ceremony for Deputy Secretary of State John Sullivan. My A-100 and the newest class of Foreign Service Specialists were invited to participate and get a group photo. Needless to say, we were all pretty excited. Chief Justice John Roberts is a legend, even among those of us with no legal background. Secretary Rex Tillerson was the first to extend his hand and start talking to us once the photo was taken. Deputy Secretary Sullivan's inspired remarks touched on the importance of values, human rights, and his commitment to our work. We also learned that his uncle was the last Ambassador to serve in the U.S. Mission to Iran and the man whose staff was held during the Iranian hostage crisis. All three have a great sense of humor, if their muttered jokes during the photo are any guide. I am sometimes asked questions from friends and family about current affairs at the Department of State being reported in domestic news. Although I am new and far from a top-level insider, I feel that coverage tends to be sensationalist. A friend mentioned he had read that Secretary Tillerson demanded that his staff avoid looking him in the eyes. That story didn't square with the warm way I, someone at the bottom of the Department totem pole, was treated at the Swearing In Ceremony. In general, I find a good mantra from the world of science to apply to media: "Extraordinary claims require extraordinary evidence." That doesn't mean those claims are necessarily false, but the burden of proof for them should be higher. Anyway, I felt very lucky to share this special experience with my classmates, colleagues, and friends! I hope I never get desensitized to the sense of wonder I feel in this job. We finally set up our Internet connection in Kenya, so I can start catching up on blog posts! First up, the trip we took to Doha, Qatar* on our way to Nairobi. The "aloha" of this post's title is both a hello and a goodbye. We spent just a short day in Doha before moving on to our new home in Kenya. The art in general blew me away while we were there. 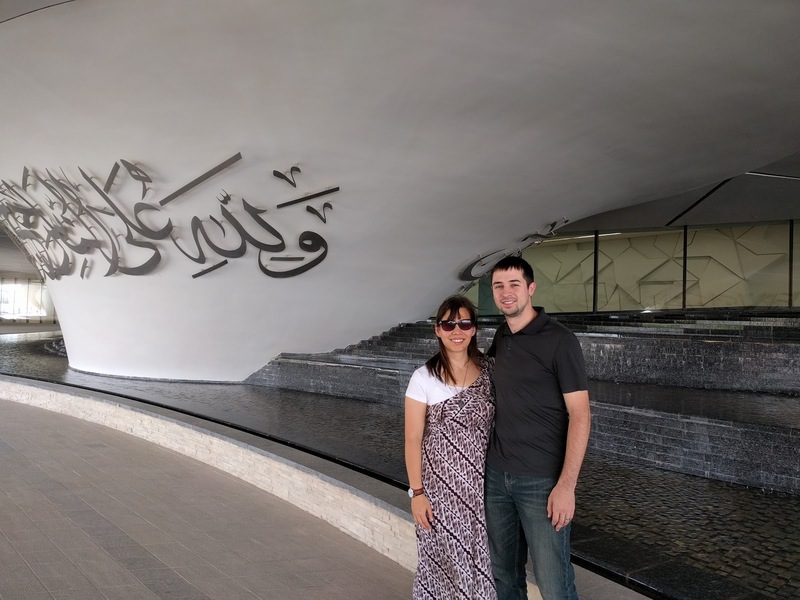 We saw stunning Arabic calligraphy, modern architecture, and historic Islamic art. 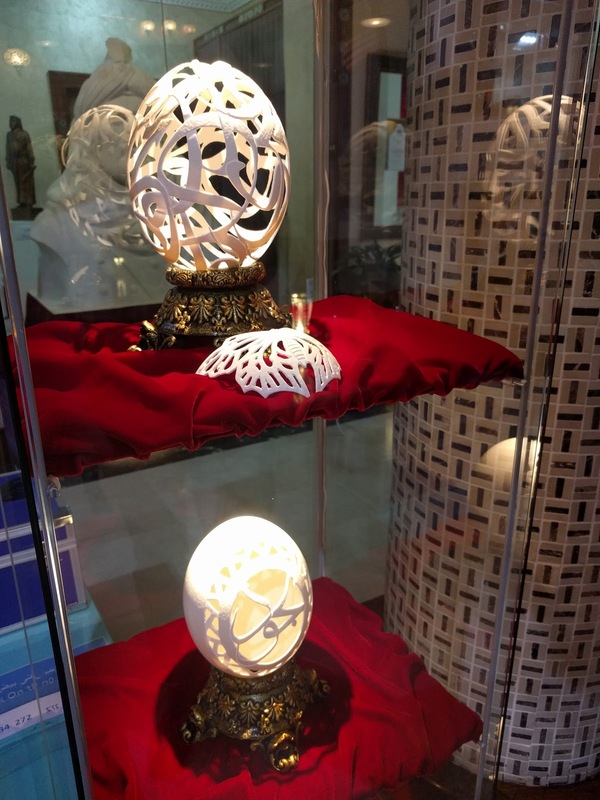 The above photo, one of my favorites, is of an art gallery where we saw things like beautiful carved ostrich eggs (see below). If I had had any extra room in my suitcase, I would've definitely purchased something. The skyline struck me as iconic, but I was surprised to learn that most of the buildings are actually new. The breakneck pace of development in Doha and Qatar generally was impressive. 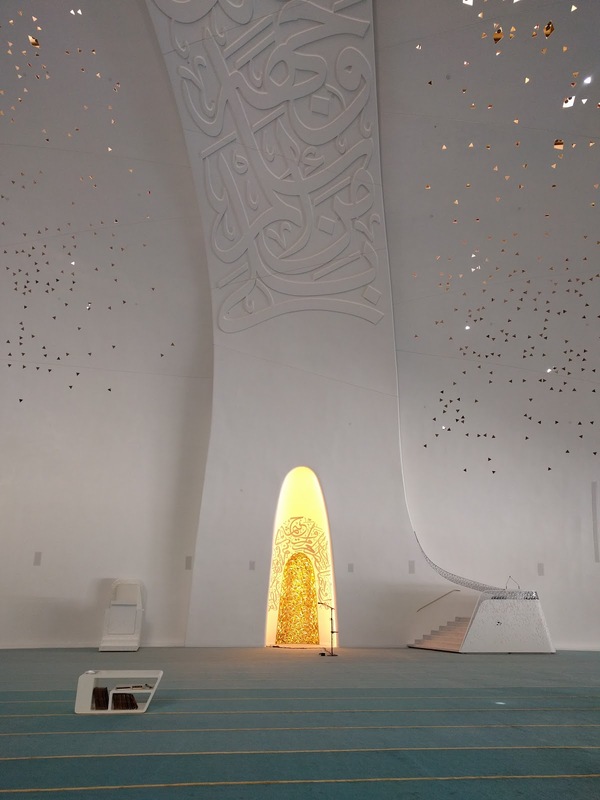 Here's the best photo I could get of the mosque interior. Check out that teal floor with gold lining! My pictures really didn't do the glittery ceiling justice. 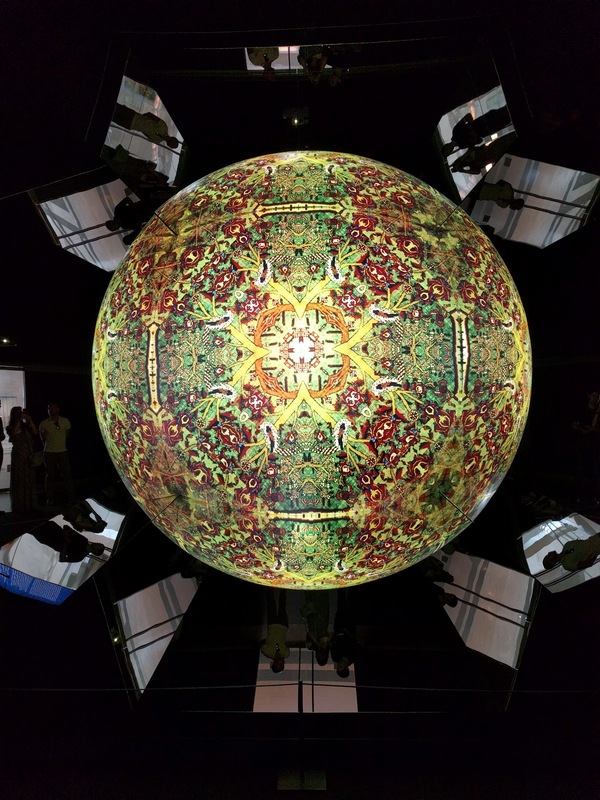 This is just one example of the pieces we saw at the Museum of Islamic Art. I love the symmetry and intricacy of so much Islamic art through the ages. We also checked out a bunch of different souqs (markets), one of the things I love to visit most when I'm in the Middle East. 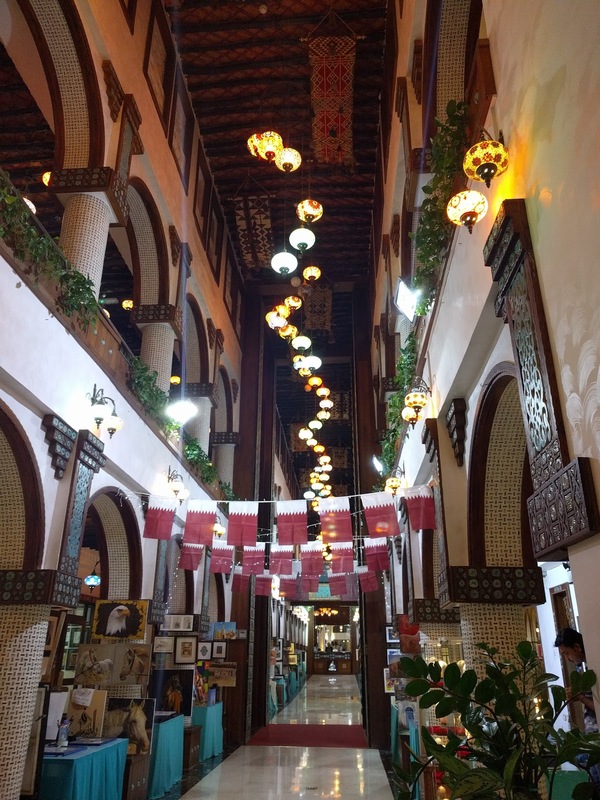 The souqs we visited were surrounded by thick walls to help keep the temperature cool, which was nice considering it was over 100 degrees Fahrenheit the whole time! As a final aside, I highly recommend the Islamic world as a travel destination for other teetotalers, because the juices and non-alcoholic drinks are amazing. 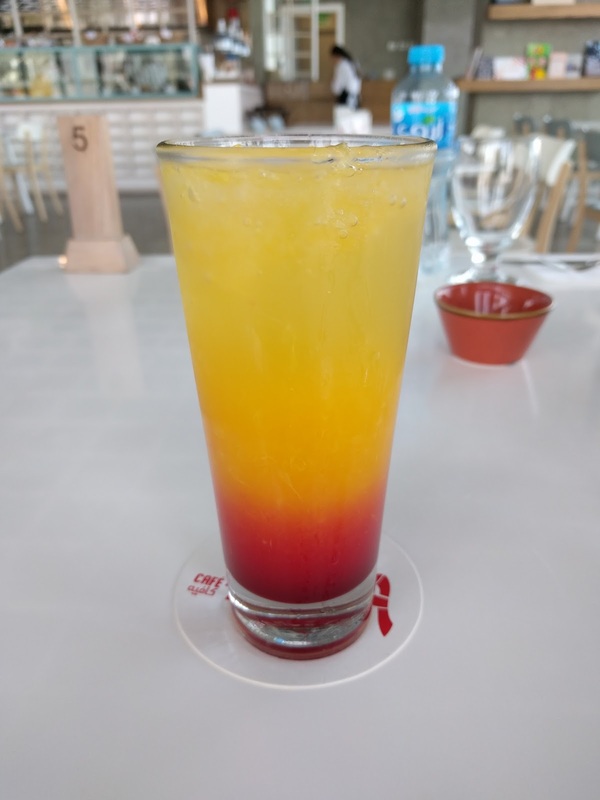 I enjoyed this delicious orange-pomegranate-spritzer concoction with my last meal in Doha. 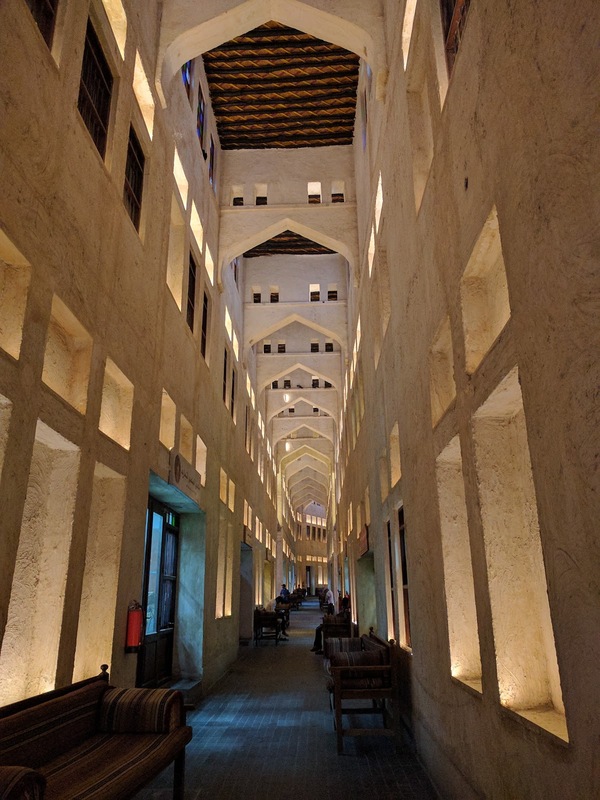 We had a great time and would definitely recommend Doha as a quick stop, especially for anyone traveling on Qatar Airways - on which I've always had a wonderful flight experience. Until next time! ...Okay, just kidding; I'm not done yet. 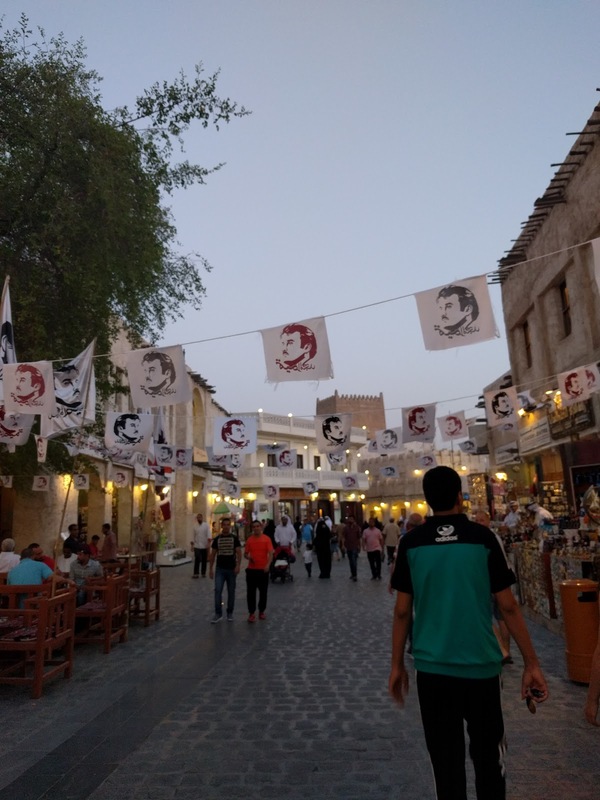 A final note: although this blog isn't about politics, it's kind of impossible not to mention what's going on in Qatar right now because it was highly visible during our short time there. 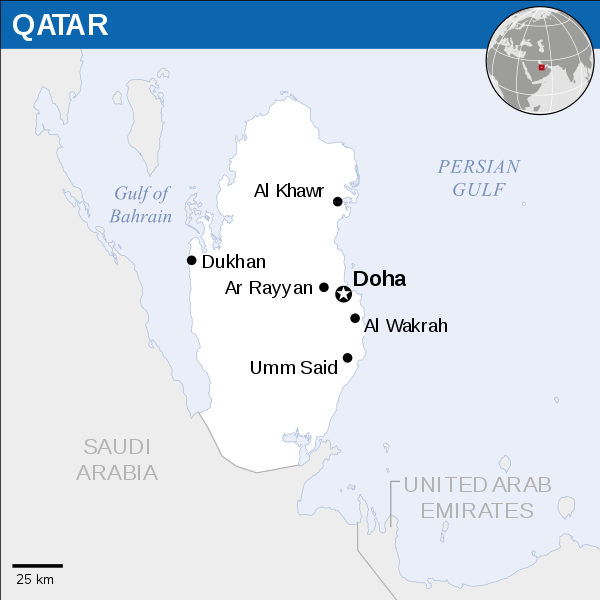 Doha is the capital of Qatar (see map below), a tiny country on the Arabian Peninsula. If you've ever heard of the news network Al Jazeera, that's from Qatar. Anyway, it's been in the headlines a lot lately for the political crisis it's having with its neighbors (which has now expanded to quite a few other nations, as well). If you need some background on the issue, I recommend starting here and here. I won't go into details in this post, as it's long enough as is! The reason why I bring it up at all is because the picture on these t-shirts was ubiquitous. 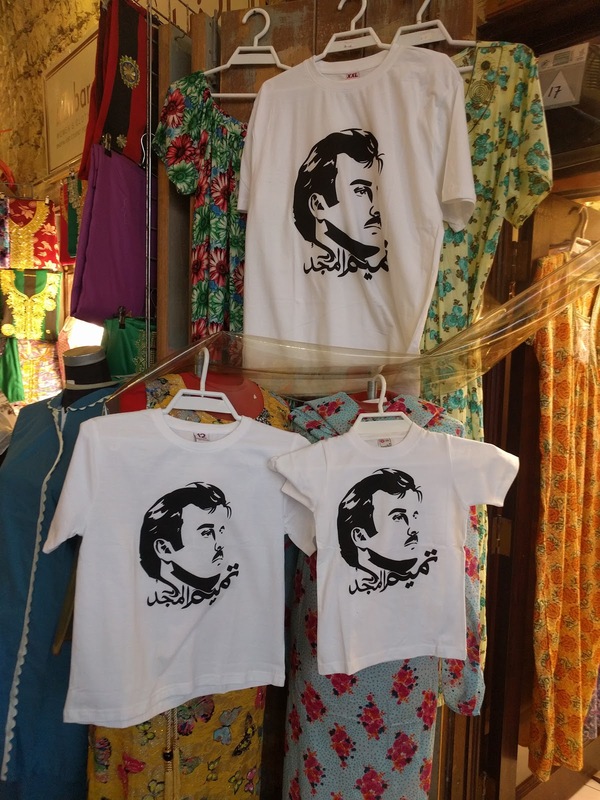 An artist drew that image of the Emir of Qatar, Sheikh Tamim bin Hamad Al Thani, and the text underneath says "Tamim is the glory" in Arabic. Qatari citizens and residents prominently displayed this symbol on cars, in shops, and pretty much everywhere you can imagine to show solidarity with the Qatari royal family. It was literally hanging on banners in the streets! I also later learned from my friend that the artist can be found @ahmedbinmajed on Twitter, Snapchat, and Instagram - so I'll give credit where credit is due. I wonder if he knew how big his campaign would become when he drew the image? Thanks for reading! 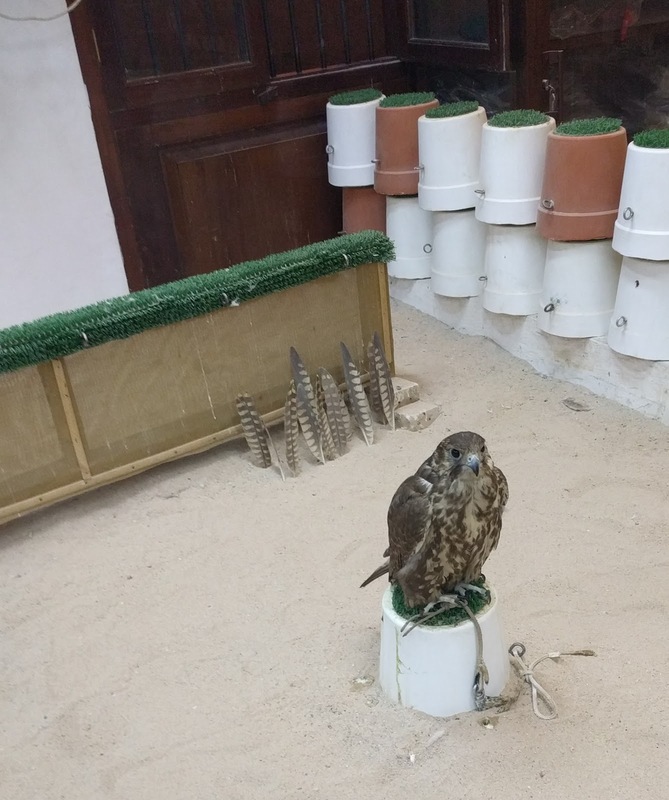 I hope that if you ever visit Qatar, you enjoy it as much as we did. *If you've always wondered how to pronounce "Qatar," then check out the discussion here.